Why we panic in airports—and why airports can do almost nothing about it. Because they require finding and isolating a threat that’s not there—and because civilians’ panic is completely rational. 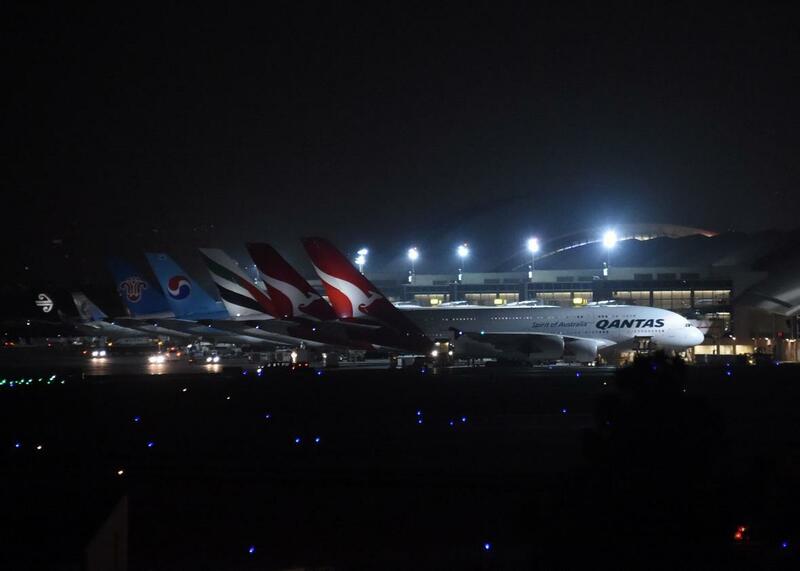 Airplanes are grounded on the tarmac at Los Angeles International Airport (LAX) late on Aug. 28, 2016 after false reports of gunfire in the airport terminal. Back in May, I was waiting for a taxi outside Mexico City International Airport when I heard a series of explosions—a pattern of deep blasts with sharp edges like rifle shots, coming from across the roadway. It took me several minutes to see what was happening: Hidden behind the concrete stanchions of a monorail station, a parade was inching down the access road, brandishing flags and firecrackers. No one on the sidewalk in front of the baggage claim had budged. Some of them might have known what I learned later: There are a lot of people from Puebla who live near the Mexico City airport, and unlike most Mexicans, they celebrate on Cinco de Mayo. But there’s no way most of the arriving travelers could have known that, and still they were calm. And calm, like panic, is contagious. You may not believe it now, but I laughed and thought: Just imagine if someone marched and launched a bunch of firecrackers down the loop at Kennedy Airport. It didn’t take nearly that much firepower to set off chaos at New York City’s biggest airport earlier this month. Apparently a few people applauding for Usain Bolt in Terminal 8 did the trick. The claps seem to have been mistaken for gunfire, which set people running and knocking over barriers, which also sounded like gunfire. The reports spread between terminals, and within an hour, the whole airport was shut down. That was on Aug. 14. Exactly two weeks later, the same thing happened at Los Angeles International Airport. Around 9 p.m. on Sunday, police received reports about an active shooter in Terminal 8. (What is it with Terminal 8s?) “Word spread quickly through the terminals by word-of-mouth, social media, and additional calls were made to Airport Police about an active shooter in other terminals, with some reporting having heard gunshots,” Los Angeles World Airports announced in a press release. Five terminals were evacuated and 27 flights diverted to other airports. In the end, there was no shooter. You can understand the challenges that such situations pose to the combinations of airport police, local police, and TSA agents who must simultaneously investigate multiple active-shooter calls and manage a crowd of fleeing travelers. False reports pose a peculiar, perverse challenge to law enforcement. Unlike an unattended bag or a man with a sword (who was detained outside LAX on Sunday night) which can be isolated and dealt with, the cascade of social media rumors and 911 calls at the airports put a vast swath of people and places under scrutiny. On Sunday, more than a hundred people called 911 from JFK between 9:33 and 9:57 p.m.
“It’s clearly an immense challenge, just because there’s no sense of location, no apparent identity, no sense of what the threat looks like,” says Tom Sanderson, a counterterrorism expert who directs the Transnational Threats Project at the Center for Strategic and International Studies. Searching for something that never happened requires a longer, more exhaustive, and more disruptive effort than finding out what did. On the one hand, it does sound like some officials at both airports lost their heads while directing the crowds. On the other, if there had truly been an active shooter at JFK or LAX, you can bet no one would be talking about whether the exit from the airport had been calm and orderly. Some survivors of the Bataclan shooting climbed out the windows; you could do worse than fleeing across the tarmac, as many travelers did at JFK. For civilians, a false alarm presents a similar dilemma. If you can see smoke or hear gunfire, paradoxically, you can sense your own distance and gauge your safety. A nonincident is everywhere and nowhere at once. Rather, Still said, these episodes should be filed to a different class of crises where perceived threats produce an adrenaline reaction. “The rumor, as Winston Churchill once said, will be halfway around the world before the truth gets its boots on,” he observed. Social media and wireless technology help and hurt, but they didn’t create the problem. The most notorious such incident occurred in Baghdad in 2005, when rumors of a suicide bomber on a religious pilgrimage produced a stampede that left nearly a thousand people dead. Look back at incidents like these and you see a pattern in the perceived likelihood of the threats. The standard for a false alarm is yelling fire in a crowded theater, but fire doesn’t kill that many Americans anymore; when the fire alarm goes off in the office, we plug our ears and wait. One of the first great stampedes in New York occurred on the Brooklyn Bridge a few days after it opened, when a woman’s screams caused crowds to rush toward land, fearing a collapse. Today, the bridge is perceived as an icon of structural integrity. A loud noise at the airport in Mexico City isn’t perceived as a threat like the loud noise that caused a frantic exodus from a mall in North Carolina two weeks ago. We have new fears now. Firecrackers have caused two stampedes in France this summer, on either side of the Nice attack. Phantom gunshots have shut down two of America’s largest airports in two weeks. The same sparks of rumor have always been there. But the tinder wasn’t always so dry.